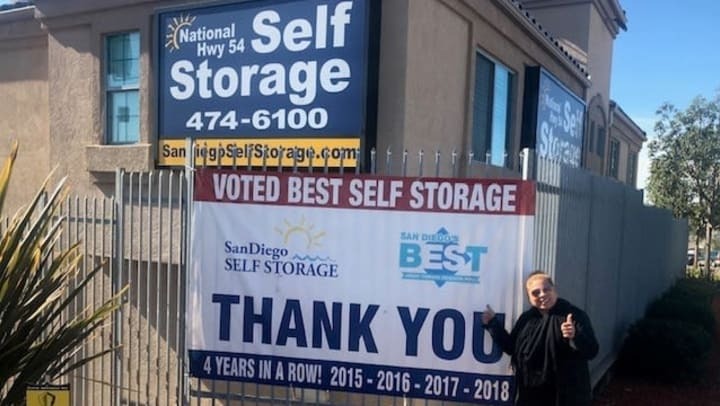 Veronica Rojas has been a loyal tenant with National/54 Self Storage for over 2 years. She and her husband both have full time jobs, kids and on top of that they also run their own party supply business- Jumpers A.B.C.V. When their company’s inventory started to expand, so did their need for a storage space. Veronica shopped around for a while, and even rented elsewhere, but found that it wasn’t what they were looking for. When they discovered National/54 Self Storage, Veronica says they knew it was the right fit. She enjoys the friendly staff and very convenient location with multiple freeway entrances, which is key for husband to be able to deliver party supplies with ease. Thank you Veronica and Jumpers A.B.C.V. for your continued business. We love serving you!